Documentation, including 1986-1989 fieldwork and 1999-2000 research, regarding New Glarus, Wisconsin’s Swiss-American summer festivals, including manuscript material, photographs, and extensive video and sound recordings of interviews with festival performers that include stories of immigration and the history of the town's public performances. Phillip Zarrilli led the fieldwork represented in this collection. Then a professor of Theater and Drama at the University of Wisconsin-Madison and an active member of the Folklore Program, he specialized in South Asian folk/vernacular drama and performance arts. Deborah Neff, then a graduate student in Anthropology, conducted extensive fieldwork from 1986-1989, and with Zarrilli produced an educational documentary video and a 48-page booklet about New Glarus, Wisconsin's Wilhelm Tell Festival for its 50th anniversary. Zarrilli and Neff did most of the videography and interviews with extra camera help from University of Wisconsin-Madison students Jerry Berndobler and Brad Bornemann. Ric Segovia added to the collection in 1999-2000 by interviewing four actors from the Tell play, videotaping the Tell performance, taking color photographs of the play, and writing a descriptive research paper about his fieldwork. At the time he conducted his fieldwork, Zarrilli lived in the New Glarus area and was fascinated by the New Glarus community's commitment to the Tell drama's annual performance in German and in English. The Tell play's impending 50th anniversary was a further spark to document the event. From the hours of fieldwork, Zarrilli and Neff produced the 50-minute educational documentary video Backstage/Frontstage about New Glarus and its festivals, for Folklore Program class use, and a 48-page booklet about the Wilhelm Tell play and its history, Wilhelm Tell in America's “Little Switzerland,” New Glarus, Wisconsin (Onalaska, WI: Crescent Printing Company, 1987). Zarilli produced the video with funding from the University of Wisconsin-Madison Folklore Program's three-year National Endowment for the Humanities grant to improve its curricular offerings. The collection's folders contain two interview transcripts, a twenty-four page written essay and four Wilhelm Tell play programs all contributed by Ric Segovia in 1999-2000. He also added twenty-four 4 x 6 color photographs of the 1999 Tell play, four 60-minute micro-cassettes recording interviews with Tell performers, and one mini-VHS documenting the 1999 Wilhelm Tell play. The collection's 39 original VHS video recordings from 1986 and 1987 document over 80 interviews with performers, musicians, local historians, shop keepers, and tourists regarding New Glarus's Swiss festivals; these include Polkafest (polka music and dancing), the Heidi Festival, the Little Switzerland Festival (Swiss folk music and dance), Volksfest (Swiss folk music and dance), the Wilhelm Tell Festival, and Schwingfest (Swiss wrestling, held irregularly, in 1978-1979, 1984, 1987, 1990, 1993). The videos also record full versions of the Tell and Heidi plays; Volksfest, the Little Switzerland Festival, and Polkafest's musical performances; and all of the Swiss wrestling matches that occurred during Schwingfest. This collection also includes nine standard audiocassettes that duplicate interviews from video footage. Consult the UW-Madison Archives for use restrictions. Please consult the UW-Madison Archives for guidelines. CSUMC's archiving team suggests the following citation form when using direct quotes from a person documented: [Name of person documented]. [Date]. [Tape/video/other]-recorded interview by [Fieldworker name]. [Place interviewed]. [Name of collection/project]. [Repository, city, state]. When using a specific image: [Identify subject matter/people in caption]. Photo/image by [Photographer/fieldworker name]. [Date]. Courtesy of [repository]. To quote fieldworker, follow bibliographical style. 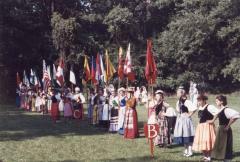 Women in traditional Swiss costume at a Wilhelm Tell play, 1999 September 4. Photograph by Ric Segovia, courtesy of the UW-Madison Archives, #S09874.